When thermals die, I think they must go to Kahana. Because on some days the thermals there can just be so damn heavenly. If you can say damn heavenly. Anyway, Monday was that kind of day. 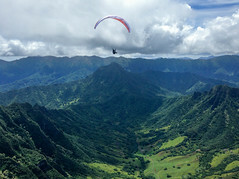 Woody and I sampled angelic columns of rising air at Kahana, Kaaawa, Kualoa, and Punaluu, as Woody tagged along for his first chronic loop, in his first real cross country wing. Woody is a great wing man, for those who haven't had the pleasure. His cross country skills are nascent, but he is a thermal machine. He was hoping to learn some cross country tips from me, and I was hoping to pimp off of his thermal hunting. I have to say, I think it worked out pretty well! Woody made some interesting cross country decisions, flying the widest line I've ever seen across the bay, then arriving super low at Hidden Valley and sniffing for thermals deep inside that narrow canyon, and then driving too far around Kualoa before turning around to escape the sink zone back there. I know he will figure out the local ridges in short order. But in the thermal department he is already a master, and I enjoyed watching how low he could grab them and spin behind each ridge, ending up deep behind the ridges but way above me, as I looked for more conservative elevators to cloud base. It's rare that the thermals are working well at every ridge in these parts, but today the lifting action was truly divine. We raced each other to cloud base repeatedly, laughing out loud from the sheer joy of it. Finally we returned to Kahana to land, just in time to fold up and rush Woody to the airport for a few days on Maui. After we left, Jeff and Jonathan scored some airtime as well. I look forward to many more cross country flights with Woody! Ok just Jealous so I had to top your stories with the Makapuu log for Monday. JJJ is beside himself and me for that matter. All this reading has made him tired so even after a tankful of coffee he's getting a few winks in before he sends SH out at noonish for more material. It's Time to Fly, Get Your Wing Man and Go!!! !